It all started last summer when they were invited to Armenia’s Human Rights Defender’s office where, along with a number of topics, they discussed children’s rights and protection. Later, they led group discussions on human rights, specifically children’s rights, with the kids who attended FAR’s Summer Camp in Hankavan last summer. The teenagers then decided to hold a press conference last November to raise awareness about abuse and violence cases against children. “Of course, we can’t end violence against children, but we can make gradual steps toward reducing it. And the press conference was one of those steps,” said Michael, stating that violence can occur due to financial instability at home, when parents don’t have enough money to care for the wellbeing of a family, and it leads to family disputes, which can later lead to emotional and psychological trauma. Although the teens don’t have a definite implementation plan for now, they will continue to support the fight against violence and abuse. “We know that there is a gap of psychology experts at school and we suggested that teachers need to have training in psychology so that they can recognize issues like signs of trauma in their students,” said Milena. We at FAR wish the three of them the best of luck and the energy they need to continue to fight and win their battles on this important journey. 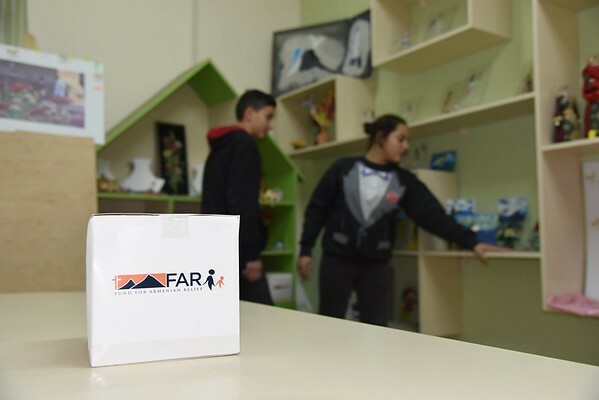 FAR Children’s Center is sponsored by the Edward and Helen Mardigian Foundation, the Friends of the FAR Children’s Center (U.S.), and the Children’s Center Circle of Friends (Armenia). It provides a safe haven for at-risk children who have faced a number of physical, psychological, and psychosocial challenges.